After convincing G’s best friend to come meet us for adventure times, he decided that he wanted to join us in Cambodia and visit the South of Laos. This meant that Kuangsi Falls was waaaaay up north and wouldn’t be doable for him. So I took my laptop and did as much research as possible about the south of Laos. 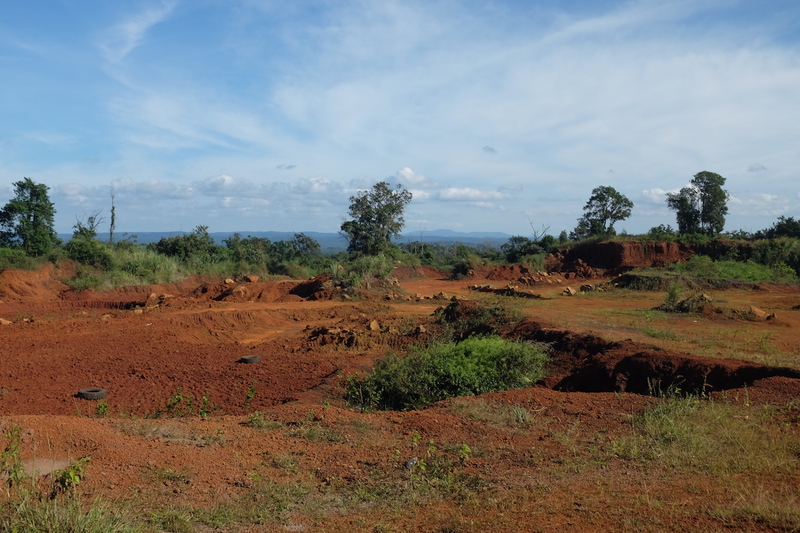 This is how I found the Bolaven Plateau Motorbike Loop. It is known as the loop of waterfalls. You know me, waterfalls are my weakness so it automatically went to our “to do” list! Let me tell you, the motorbike loop did not disappoint! Where to go / what to see? Leaving Siam Reap (and the Angkor temples) by bus, we arrived in Laos in a small town called Pakse (where the Bolaven Plateau Motorbike Loop starts). G did some research and found out that Miss Noy Motorbike is the best place to rent in town so we did. We definitely recommend renting your motorbikes from there since they are very helpful and show you exactly where to go. Having never ridden a semi-automatic motorbike in my life, Yves (the Miss Noy’s Belgian husband) convinced me to give it a try and promised me to show me how. Note that we arrived very early and were travelling during low season. They are very popular thus very busy, so I doubt they have time to show others how to ride a motorbike during high season. After practicing for 15 minutes, I felt confident enough and decided to do the whole loop on my very own motorbike. If you have ever driven a car and a bicycle, you should be able to ride a motorcycle. However, be safe since we have seen way too many people driving too fast and recklessly. 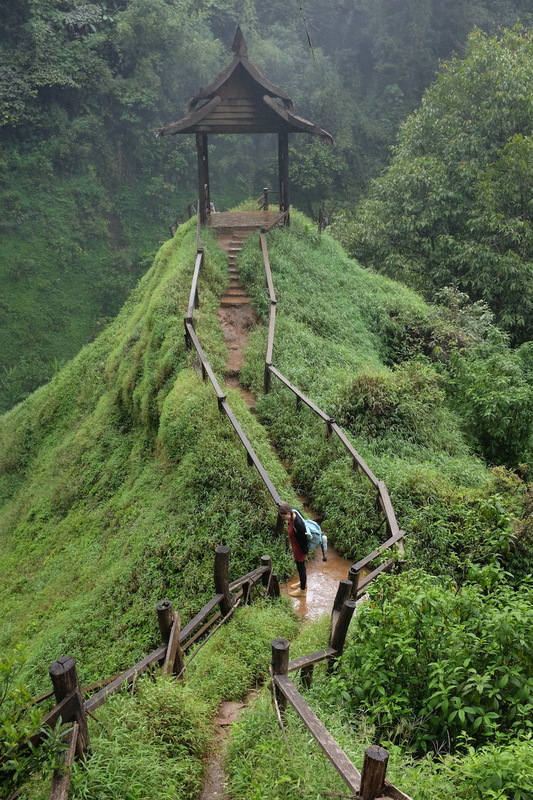 The Bolaven Plateau Motorbike loop is known for its many waterfalls. You can either do the small loop or the big loop, depending on how much time you have. The small loop takes about 3 days and the big loop about 4. Since we had been running so much we decided to take our time and do the big loop at our own pace. We ended up spending a week on the road and do not regret it! Little tip if you’re hesitating, the most beautiful nature we saw was definitely on the big loop. We drove between the mountains. It was amazing! Since we left quite late in the day, we only managed to visit one waterfall and stopped for the night at Mr. Vieng’s coffee plantation. Make sure to stop by and meet him. He is a lovely man and knows everything there is to know about coffee. We spend a wonderful evening talking to him and learning all about the Bolaven Plateau and the different tribes living there, and his coffee plantation. It sure is one of my highlights of the trip. The rest of the loop can basically be wrapped up by waterfalls, waterfalls and waterfalls. I think we managed to visit about a dozen waterfalls on our way. Me being a sucker for them was beyond happy. 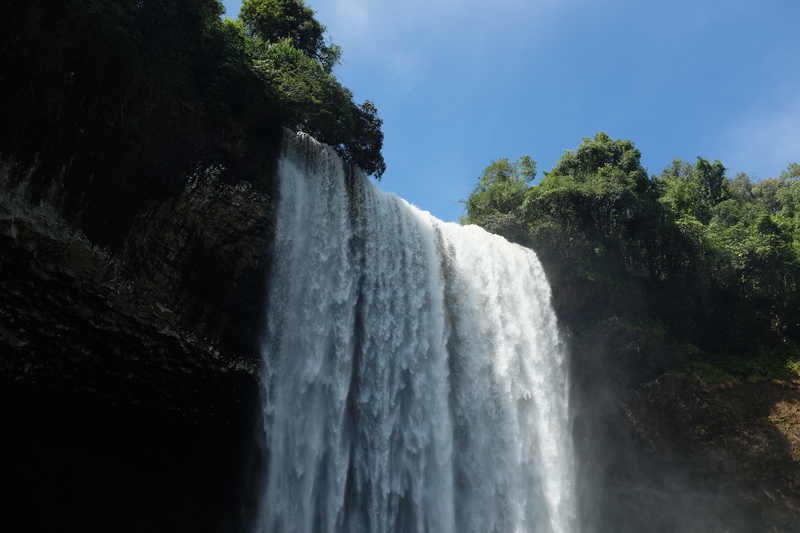 We’ve also decided to compile a “Practical reminders for a perfect trip around the Bolaven Plateau” to help you prepare for your trip (or shall we say adventure!?). Pack light (especially if you do the big loop) because a heavy bag will the death of you (and your back). Get several copies of the map you’ll receive at the rental place because you don’t want to be hours away from Pakse without knowing your way around. We also recommend using Maps.me for offline maps on your phone – it’s not always accurate and roads tend to be trails more than anything else – but better be safe than sorry. Bring mosquito repellent, sunscreen and toilet paper! Get a good bike (and make sure it’s in good working condition). Usually you’ll get a semi-automatic Honda Wave, 110 or 125cc, which is pretty good for the sometimes steep portions of the loop. If you get anything “smaller”, you might want to reconsider. Also, although you could be two people per bike to save money, we guarantee you’ll be more comfortable if you have one bike per person. And obviously, wear a helmet (preferably with a visor if you don’t want to eat bugs or rain). Bring a poncho or a rain jacket because it can pour really hard, and for a while haha! Wear a long sleeve shirt and long pants. This will prevent huge sun burns from the long hours on the road and keep you warm during the chilly evenings. Wear closed shoes (and avoid flip-flops), it will keep your toes and feet safe if you crash with your motorcycle. Note that some of the waterfalls are more remote than others so you’ll be happy to have good shoes when you have to walk through the jungle haha. Bring enough cash (preferably smaller notes – avoid 50,000 and 100,000 ones as most food stalls or stores won’t have change for those) as there are no ATMs on the farthest part of the loop. If needed, we saw one in Tad Lo, Sekong and Paksong. Wherever you stay for the night, always make sure to park your bike in the guesthouse or homestay’s safe place. It’s usually fenced to make sure you don’t get your motorcycle stolen while you sleep, even if it was a locked properly. This brings us the the second advice: always lock your bike, even if you’re away just for five minutes. And make sure your rental place gives you a chain and an additional lock (that you’ll put through your disc brake). Wear a helmet! It sounds obvious but we’ve seen a lot of tourists not wearing one. You only have one head so protect it! Always pay for parking at waterfalls. It might look like a scam but these guys will make sure your bike is safe. Don’t be cheap and park on the side of the road and walk all the way to the fall, this might get your bike stolen. 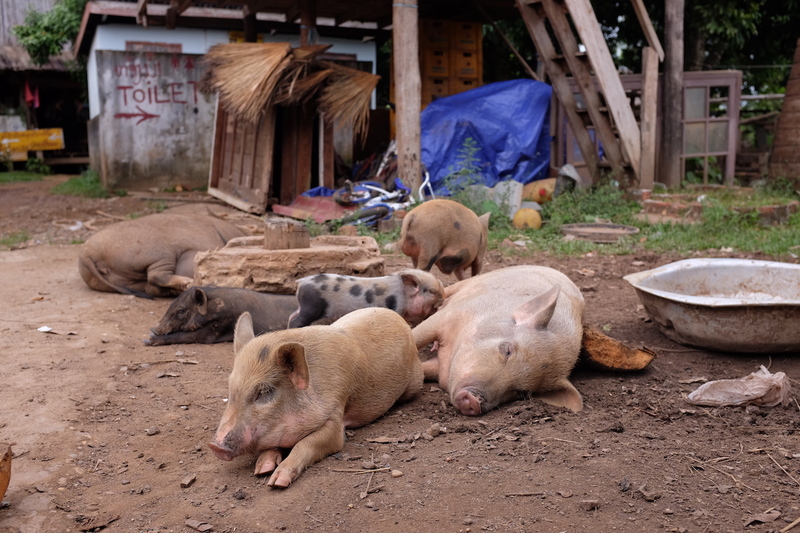 If you’re vegetarian or vegan, one simple trick will help you a lot in remote places around the Bolaven Plateau, where no one speaks English. Download pictures of simple food you can eat (rice, noodles, veggies, fruit, nuts, tofu) on your phone and show them when you try to order. It’s far from a 100% guarantee you’ll actually get a vegan plate but it’ll get you the closest to it as possible. Usually at that point they’ll put rice or noodles and veggies in a bowl, and point towards all sorts of meats that you’ll then just respectfully show you don’t want. Get gaz in bigger cities (Tad Lo, Sekong or Paksong) before heading to more secluded areas. This is particularly important if you decide to go from Tad Lo / Sekong to Tad Tayicseua (it’s a 71km remote stretch with no place to refuel – and also the only place we say a cobra haha). We did the entire big loop with around 2 or 3 full tanks in total. Avoid riding at night as the roads are sometimes in bad shape, you’ll go through really remote areas and there’s no lights anywhere. So make sure you make it to your sleeping place before nightfall. Time your visit. We went at the end of rain season (mid-October / November) and hoped to swim in some of the waterfalls but that didn’t happen because the current was way too hard. 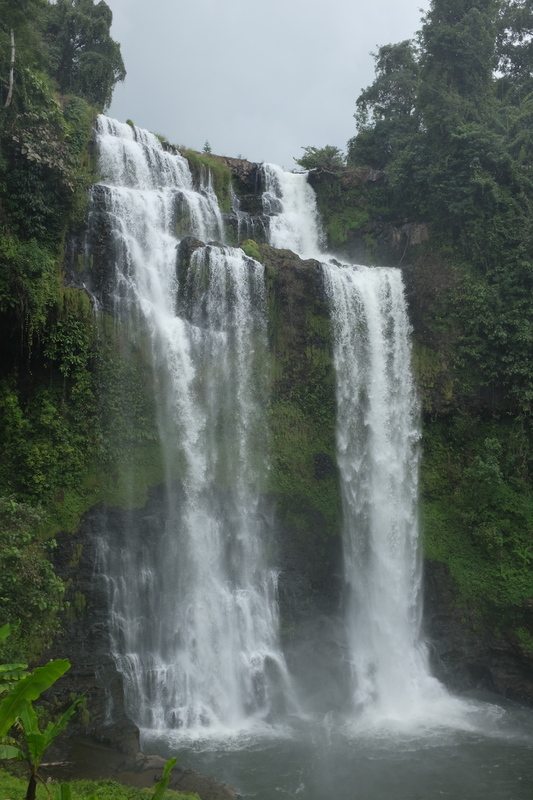 We’d also recommend skipping rain season altogether because the paths and trails to most waterfalls get extremely slippery (and so does the main road in most part too). The following are our highlights of the big loop (in no particular order, and by no means an exhaustive list of things to check out). 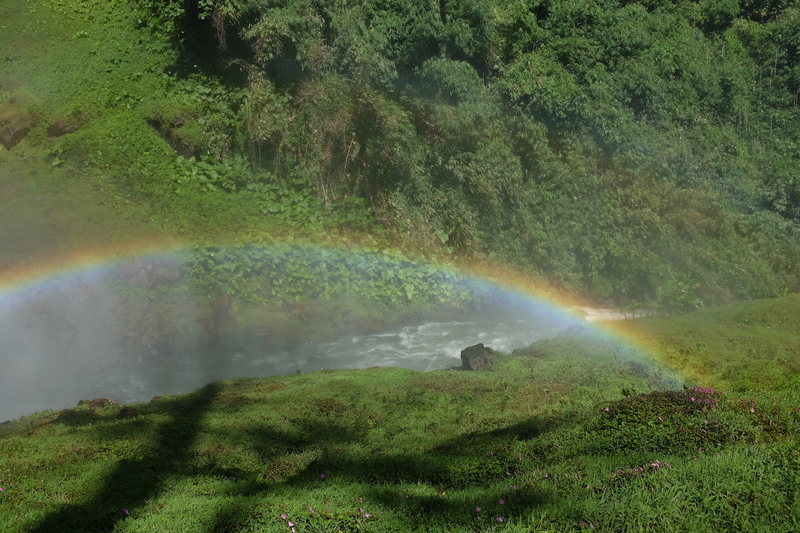 If you’ve been to the Bolaven Plateau we would love to hear about YOURS in the comments! At the end of our first day (starting from Paske, about 60km away, on your left when you do the loop clockwise), we were a little to late to drive to the next town (Tad Lo) so we had to sleep at Mr. Vieng. 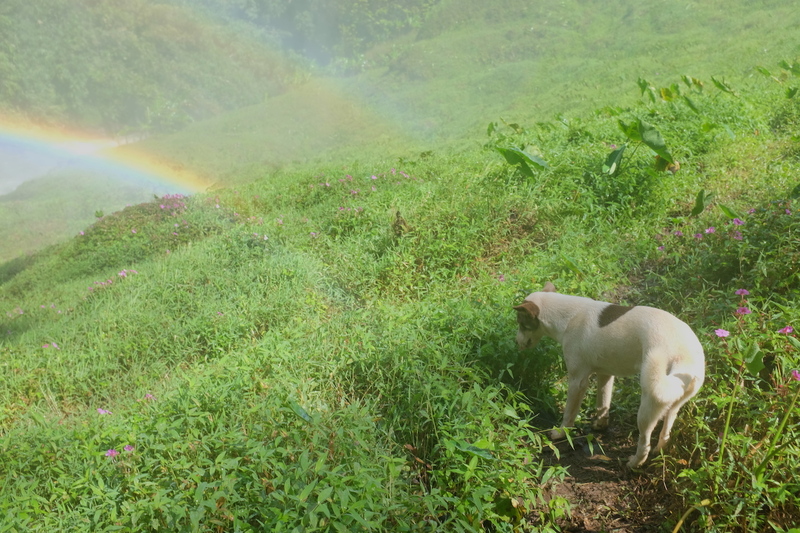 Usually you can visit his coffee plantation during the day but we didn’t get to because it was too late. But what we had was even better! After preparing us (vegan!) food, we spent the evening chatting with him about how he grows and sells his coffee, how you harvest and roast peanuts and how the Bolaven Plateau is made of many different tribes that speak different languages and have only Lao in common. The accommodations are very basic (it cost us 20,000kip/person – around 3 CAD or 2.5 USD) but the amazing coffee and company made it an unforgettable experience. So whatever you do, stop there! Tad Lo has accomodation options for every budget. We went for the cheaper side. Sailomyen Guesthouse has huts on stilts, just over the river. It’s very basic (no Wi-Fi, cold bucket shower, squat toilets) but comfortable, clean and has everything you need (towel, mosquito net, fan). And you get your own hammock to relax on the deck overlooking the water! You obviously can’t book online and will need to check out availabilities when you arrive (this is the case pretty much everywhere on the loop). The food options there are very limited, so we suggest you have breakfast a little further down the street at Mama Pap’s. She serves her legendary huge and delicious pancakes! It’s also a pretty cheap and great place to sleep if you don’t mind dorms. Once your stomach is full, go check out Tad Lo and Tad Hang waterfalls, it’s a nice relaxing walk. If you need internet access and/or want to eat typical French food like cheese, red wine and dried sausage, stop by at Fandee Guest House. This French family is very welcoming and also has (slightly more expensive) rooms with hot showers and private bathrooms. 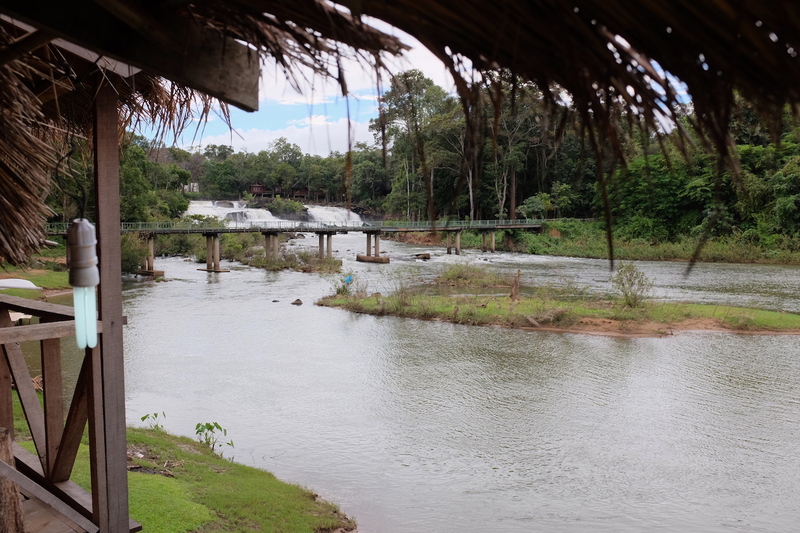 It’s a great gathering spot in the evening for a lot of people doing the Bolaven Plateau loop. If you’re looking to share experiences with your fellow travelers, that’s the place! This sounds obvious but we’ll still remind you to leave the main road to go see the many waterfalls (isn’t that the whole purpose of the loop?). That being said, be smart about it: skip the smallest ones if you’re in a hurry, don’t go down dirt road/paths when it rains too much and avoid waterfalls that your scooter renting place suggests you not to go to. It’s really hard to choose in between all the falls but those three would be our favourite epic ones. Tad Soung might be our favourite waterfall. We tried to go see it from the bottom but somehow couldn’t access, but the best about it is definitely the view from the top. It somehow made me think of a scene out of Jurassic Park. You can even bathe over there but make sure you’re far enough from the edge because it can get really windy and be careful, they often let more water in at 4PM to feed power to hydroelectric plants. You know those unreal green tropical waterfalls you see in movies or shampoo ads? Well that’s what Tad Tayicsuea looks like! They’re actually 7 falls “close” to each other so make sure you plan 2 or 3 hours if you want to see them all. Note that it’s quite a slippery and mosquitoes filled hike, but it’s worth it! This is one of the few more touristy places on the loop (but it’s far less crowded than famous waterfalls we saw in Indonesia). Tad Yuang (also called Tad Gneuang) also has that crazy lush green jungle around the 40m high waterfall. It costs 10,000kip for the entrance and another 5,000 to park the scooter. The road/path to get there is a little slippery if it rains so be careful. We added this one to the list of places you shouldn’t miss but we didn’t get to go because the weather was so bad when we tried. It was raining so hard that we could barely see the road, one of the locals even crashed his motorbike just in front of us! But apparently this waterfall is amazing and 120m high. Tad Pha Suam: this was our first waterfall, it’s not very impressive but the whole place is pretty nice to walk around and they have a suspension bridge! Tad Houa Khon (Tad Se Noy): you will definitely check them out if you decide to stay at PS Garden (cheap campsite). Tad Lo and Tad Hang: it’s hard to not see them when you get to Tad Lo but if you’re short on time, you can skip the walking to the top. Tad Champee: apparently it’s the best waterfall to swim in (we couldn’t because of the amount of water). It looks nice but the road is extremely tricky and slippery, so avoid it if you’re not comfortable on a motorbike. Tad Faek: unimpressive one, we would honestly skip it if we were you. Tad Alone and Tad Couple: same thing, save some time and keep driving :). We couldn’t find info about this online but we stopped for a delicious fresh orange juice in the middle of the mountain at Thanathon. When you do the Big Loop you end up riding in a very secluded area for a while so this was a very nice surprise. We took a break there before heading to the Platinum Guesthouse where we stayed for a couple of nights. The lady working there was so nice that she even washed my shirt three times to try to get the red dirt stains out of it haha. So this was it for our Bolaven Plateau motorbike loop highlights and suggestions, we hope you’ll enjoy your experience as much as we did! Let us know in the comments if you have any hidden gems we didn’t write about. I just was wondering for the luggage as we travelling a longer period in Asia, is it possible to leave somewhere the luggage, take a smaller BackBag to do the loop and pick up the luggage afterwards? Yes! We left our luggage at the place where we rented our scooters (Miss Noy). They have a room in the back where you can leave your stuff. Even though it’s safe, make sure to bring your valuables with you on the loop.